Winter wonderland wedding centerpieces really help to make your winter wedding complete. A winter wonderland follows a blue and white color scheme. Silver would also go well with blue and white too. There are many different centerpieces that you could use – and here are a few ideas. There are quite a few different types of winter wonderland centerpiece ideas that you can take advantage of. Small trees in particular can look great with LED blue lighting draped through the branches. You can also find silver trees that wouldn’t necessarily need combined lighting. This would be good for those who don’t want to spend a fortune on their centerpieces. Look for accessories that will add a little sparkle to the centerpiece. You could use candles to give you the romantic lighting that you want. There are many winter style candle holders. Why not look for one that has a snowflake theme? Snowflake candle holders typically come in a silver glittery color. 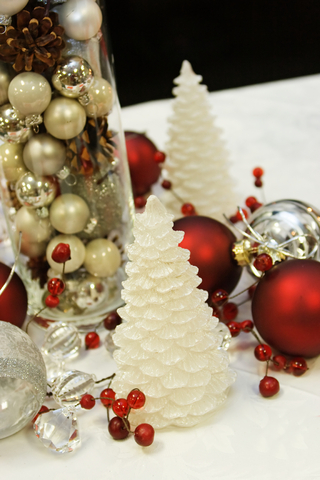 Purchasing separate snowflakes to place around the centerpiece will complete the look. If your wedding is quite close to Christmas then you could always use a small tree with baubles hanging from the branches. Again you should choose baubles that match your color scheme. Deep red colors can also go well at Christmas time. If you want to use flowers then choose white roses in a tall vase. Lilies as well as Christmas greens can work really well. Or how about combining one of the above with rhinestones for a fantastic display. Overall when it comes to a winter theme you want something that gives a slightly chilly, yet romantic appearance. The above are just a few of the ideas you could use. Just remember to use blues, silvers and whites when choosing the best winter wonderland wedding centerpiece.